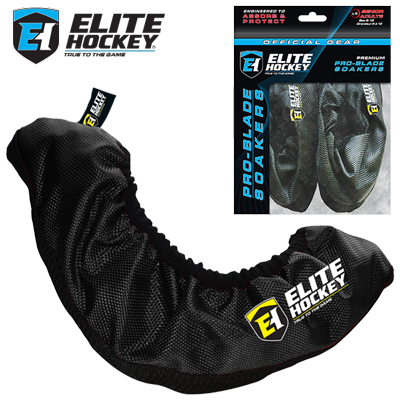 Specially designed to easily slip over the sharp edges of your skate blades, Elite Hockey® Pro-Blade Soakers provide the ultimate protection from nicks and cuts to both your hockey equipment and bag. These Soakers feature an inner terry lining that absorbs excess water from your skate blades to help prevent them from rusting. The reinforced integrated inner and outer polypropylene web band on the bottom prevents skate blades from chipping and prolongs sharpening. A water resistant nylon outer shell provides unsurpassed protection to the inner material layers of your soaker. Fits skates sized Sr 6-12.